The next topic we’ll be addressing in our “eco elements” is the three R’s – reduce, reuse, and recycle. Head’s up, it’s time for a shop curation! To give you all a couple of weeks to snag your favorites, I won’t be curating until the end of our look at the three R’s. And a 2nd heads up – those design which aren’t curated will be updated to the new pricing structure very soon after curation. So if there is a pre-2018 design you’ve had your eye on, now the time’s to grab it… at a discount! Other ways I seek to reduce, using up my discontinued yarn stash, particularly during the Indie Design Gift-a-long. But truly it’s a year round project. GDCSJ Puddles in particular likes to stash dive for charity projects. 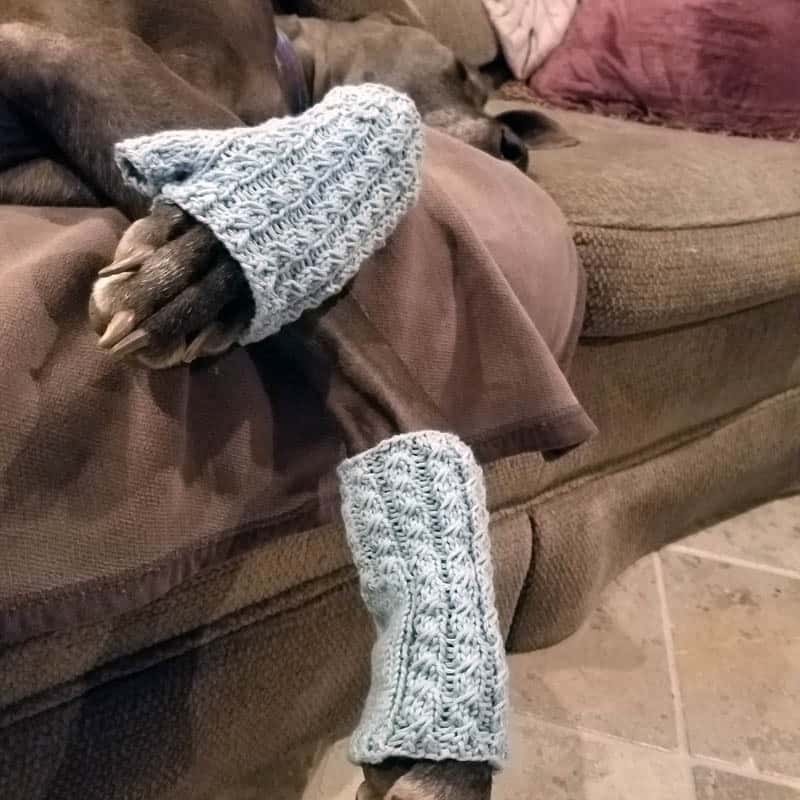 Puddles “knit” these “Dean Street Mitts” by Nina Machlin Dayton during the Ravellenics! A win-win-win – stash down, I learned something new, and they’ll be headed off to the shelter this Fall to warm someones hands with organic cotton and love. What’s your favorite way to reduce? The feature design of the 3R’s falls into this category. The yarn is leftover from another design. 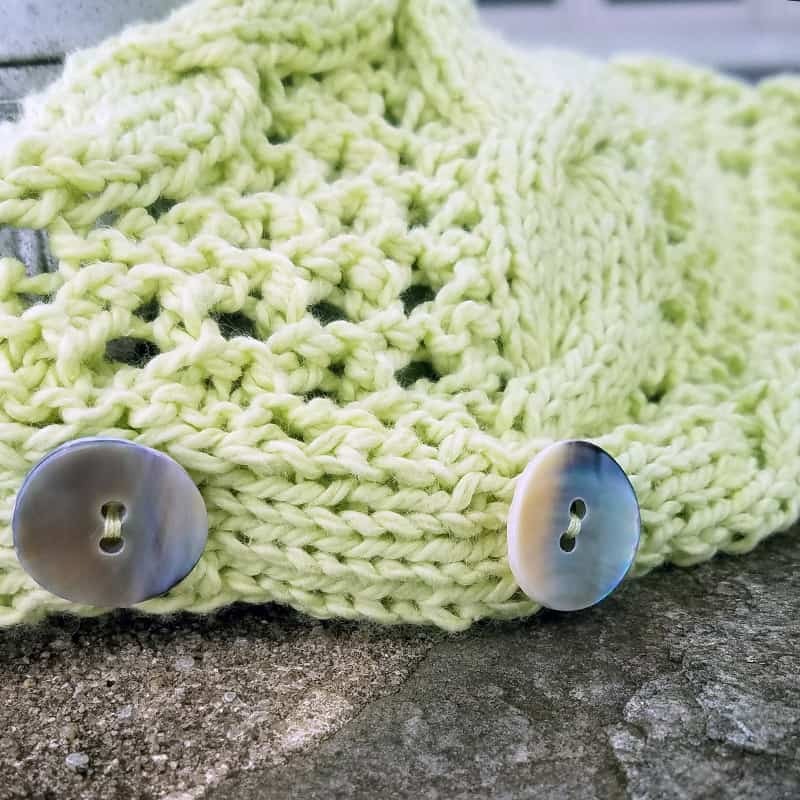 The main stitch pattern is a remix from what you guy’s voted to be your favorite design of 2018, but the style is completely different as is the category! Eager to see more? Stay tuned, these naughty digits will be dropping hints right up until the release! 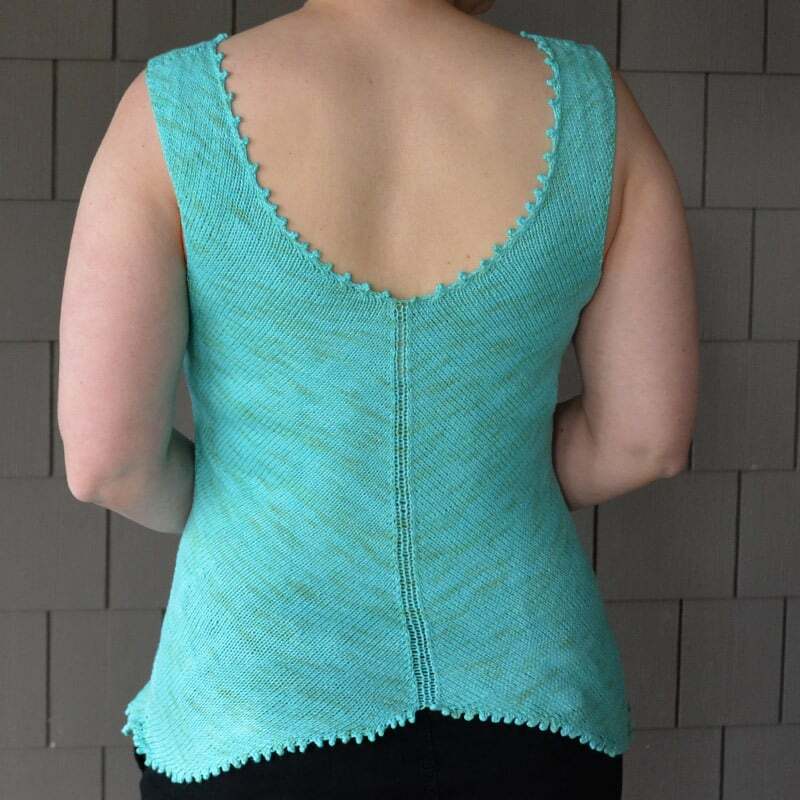 Have you ever ripped out a FO in order to salvage the yarn for another design? I did that several years back on my personal FO in order to finish the yarnie’s “Ladies Night Out” sample. Last year, my co-indie inspired me to finish the job as I had only harvested enough for the other sample and mine lay in the closet unwearable. It was SUCH a refreshing accomplishment… after it was complete. Now I have a “Ladies Night Out” tank that I love and was able to upcycle the not enough to be two long sleeve leftovers into a hat by said designer. In the process she may have created a bit of an addict as my Cassandra Christmas Sweater is sitting half frogged on my desk while I design a new sweater with the yarn! 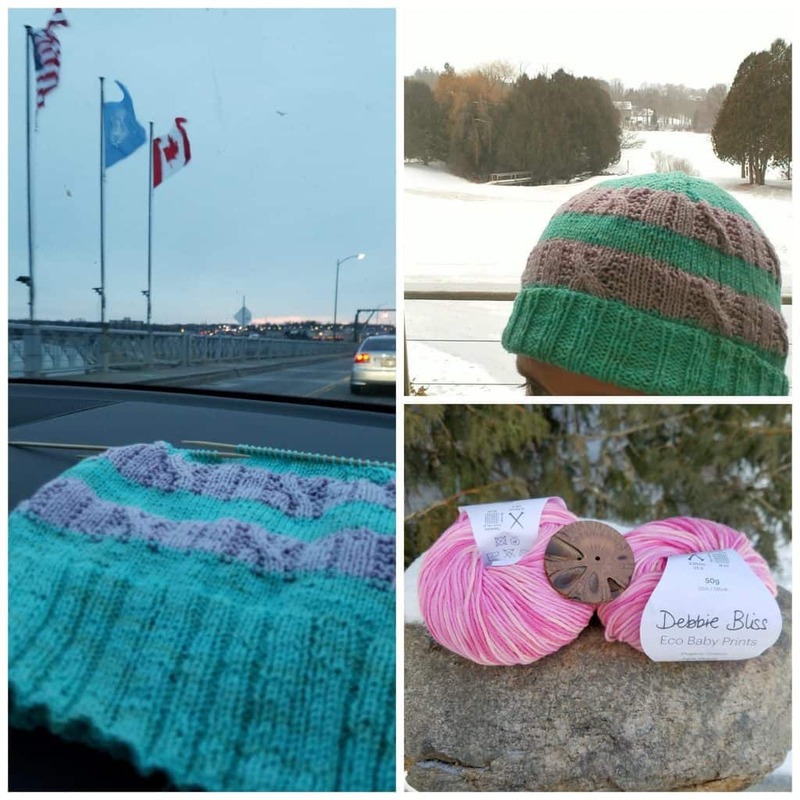 From this summer: Driving up – I knit with Three Irish Girl’s Organic Cotton and Bamboo in Talitha Kuomi’s “Crossway Hat” KAL… and rewarded finishing with a yarn purchase from the LYS. I just couldn’t resist that button either ;-). Of all eco principles, the 3 R’s are probably the most widely known and referred to. I’d love to hear how you incorporate “reduce” “reuse” and “recycle” into your crafting!